An invaluable guide to aviation law for managers, pilots, mechanics, aircraft owners, air traffic controllers, air safety investigators, or others involved in aviation as a profession or hobby. Practical Aviation Law provides the basic knowledge and perspective to understand how the legal system works in relation to aviation. Helps readers recognize and avoid common legal pitfalls, and be able to discern when they need to call a lawyer. Uses clear and understandable language to provide a succinct foundation to a complex field of law. The conversational tone and frequent examples, many drawn from author Scott Hamilton's experience in practice, make this a most readable law book. The fifth edition has been updated and expanded to reflect statutory and regulatory changes. 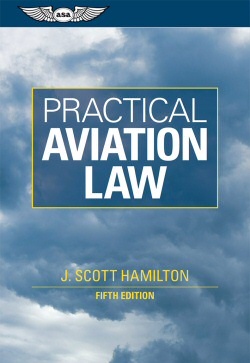 When used in conjunction with the Practical Aviation Law Workbook, this book serves as a textbook for undergraduate aviation law courses. Free shipping of this item worldwide.